During our last board meeting, we discussed the difficult financial situation in the country. “A large prominent organization had just notified its staff of their lay off,” explained one of the board members. An old friend who runs a community based organization wrote me asking for advice. “We have been forced to lay off staff,” she explained. “And we don’t have the funds to pay rent.” We are also struggling with our financial solvency. It is disappointing to me. It would seem obvious that friends of Palestine would want to give directly to local indigenous organizations who directly serve the local population. International organizations seem to be doing all right. I was recently approached by an international organization with a large EU funded project. They wanted our help in community mobilizing. “This is what we do,” I explained. But they did not budget for any external consultancies. They had hoped that a small community foundation with less than three staff members would be able to support their work without any remuneration. They must know that we too, despite being small and local, must pay the monthly staff salaries and rent. Another international NGO who received a large grant from their government recently partnered with a few local organizations in an effort to ‘build their capacity’. We meet periodically and I answer their questions explaining to them what I already know. They want to help us meet our needs and priorities. But we know our needs and priorities and these multiple meetings explaining our situation is taking away time and energy from the work that needs to be done. Last November, I traveled abroad to connect to the Diaspora. I tried to explain the international aid system, and why supporting an indigenous community foundation would be more cost effective. And yet, I witnessed fundraising campaigns for the benefit of UN agencies. As a former UN staff person, I am sure that my fellow countrymen in the Diaspora are not are aware of the high overhead eaten by such bureaucratic machines and the extremely generous remuneration offered to its international staff. Such organizations are so far removed from the local community and often must resort to local organizations for support. Necessity is the mother of invention. What about collective necessity? Youth all over the world are encouraged these days to be solo entrepreneurs; to become the best inventors; to compete with others to create the best products for individuals, increasing consumerism globally. This competition over inventions and individual needs has limited youth from thinking about collective needs; the needs of a community; the needs that ensure the well-being of every individual in the community. Through the IBDA’ youth program from the Dalia Association, we encourage youth to become active citizens and contribute to the development of their communities by using local resources, and the public participation in identifying, selecting and implementing projects of benefit to the community. For the ‘Youth in Local Economy’ project, we encourage Palestinian youth to think of income generation and environmentally conscious initiatives that benefit their local communities. The "Students’ Project", with the Orthodox School of Bethany in Al ‘Eizarya, focuses on students identifying community issues, and voting for their priority. Students will implement the identified priority either by providing a grant, or implementing an activity to address their priority. Throughout the months of September and October, training workshops have been provided to the youth in the areas of Fasayil, Jiftlik, Mazare’ Al Noubani and Saffa, as well as workshops with the Students’ Project in the Orthodox School of Bethany in Al ‘Eizarya. The trainings focused on creative brainstorming, the importance of community work, identifying community needs and priorities and the ability to create projects benefiting the community. In addition, the workshops introduced concepts of alternative economies to support the development of a local and strong economy, making the best use of local resources and using methods of non-cash resource exchange. These workshops proved to be very beneficial. In an open meeting to vote for projects and initiatives in Mazare’ Al Noubani, the youth groups proposed four ideas. "Yom Al Falah Al Falasteeni"(Palestinian Farmer Day): a store selling local products; a service center: to fulfil all the needs of the citizens; a kindergarten for helping working families to take care of their children, and finally a complimentary education center that provides extra classes to support students in certain subjects. The youth community eventually voted for “Yom Al Falah Al Falasteeni”, and the service center. In Fasayil, the community voted for a public garden and a mobile restaurant, while in Jiftlik the local youth voted for a public garden with a kitchen/ cafeteria to provide meals for the visitors as well as local schools, and a sports center. The Palestinian Youth are making us proud, for they are the now and the future! 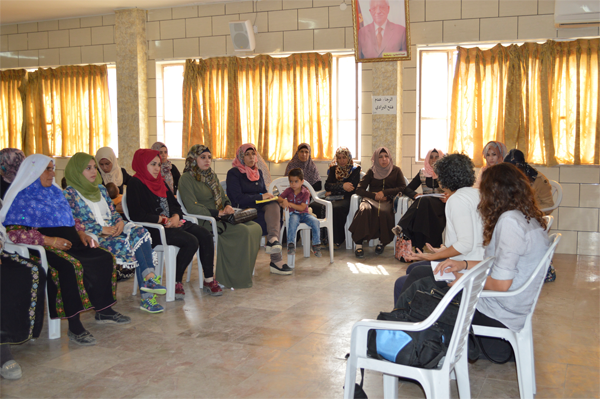 Dalia Association launched on the 27th of October its Women Supporting Women Program in the south of Hebron region, with the presence of women groups from surrounding villages, as well as women groups from the governorate of Yatta. The program aims at empowering women to lead in community decisions, identifying their priorities, as well as mobilizing local resources to support their creative initiatives. Dalia Association signed a grant agreement from the Village Decides Program (VDP), with Tuqu’s Youth Entrepreneurs Group. The community voted for two community initiatives including the Tuqu’s Youth Entrepreneurs Group, and Al Ghad group for People with Disabilities. The VDP program aims at encouraging local communities in identifying priorities that benefit the entire community, as well as mobilizing local resources to support these issues . The grantees’ project mainly targets the youth in the town, as well as other sectors of the community. They plan to conduct high quality training workshops answering to the needs of college students and graduates, revive eco trails through hiking activities around the area, establish the first Dabkeh group (folklore dancing), and finally launch a magazine that focuses on youth issues in Tuqu’. Dalia Association’s staff conducted its annual retreat in the south of West Bank in Palestine, starting with a small hike in the gorgeous Al Makhrour valley in Beit Jala. Later a workshop took place to plan and create an updated strategy for the coming years. We are grateful to Yara Abdul-Hamid who volunteered to facilitate the retreat and provided us with training on creating such strategies. Following that, we visited Arab Al Rashaydeh Bedouin village in the Jordan Valley, then drove to the area overlooking the Dead Sea. At the end, we drank tea with the local Bedouins and engaged in conversations with them. The Second Dukkan Initiative- Opening soon! This is a call for EVERYONE! After the outstanding success of the first Dukkan initiative, (all thanks to your generous donations, and volunteering!) we will be opening our next Dukkan initiative soon! Clean out the clutter in your homes, and donate your slightly used items to Dalia Association’s office in Ramallah, Al Sahel Street, close to Darna restaurant, from Sunday-Thursday from 8:00 am-4:00 pm, or call us at 2989121, or email us at [email protected] for other arrangements! Let’s make our environment clean by reusing our resources! Finally there is a shop for everyone! Follow us on Facebook to know where and when our next Dukkan initiative will take place!